As many readers may have observed recently, US dollar LIBOR has been ticking up noticeably over the last week or two. 3 month LIBOR is now 72 bps, the highest it has been since mid-2009. 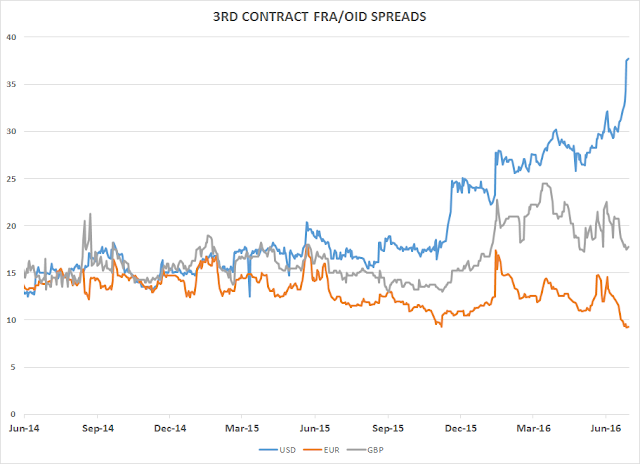 FRA/OIS has widened sharply, a move that has not been reflected in other currencies, as the chart below amply demonstrates. What's going on here? The answer, quite simply, is money market fund regulation in the US. This has been well-flagged amongst fixed income investors but is perhaps less well known in the equity space, Essentially, on October 14 prime money funds will see their statutory maximum weighted average maturity fall from 90 to 60 days, will be forced to institute floating NAVs to reflect the actual underlying value of their turds assets, and will have the ability to impose a temporary gate should things go badly awry. The upshot is that prime fund assets have fallen by nearly $500 billion over the last year or so, with government-only assets rising by an equivalent amount. This represents a significant decline in demand for commercial paper and other short term private sector instruments which should, all else being equal, push those yields higher. Why did LIBOR start ticking higher last week? Well, that was when the 3 month maturity date fell after the October 14 reform trigger date. You can read more about these issues here and here. * A stronger dollar. In a world of ZIRP and NIRP, every little bit of yield helps. 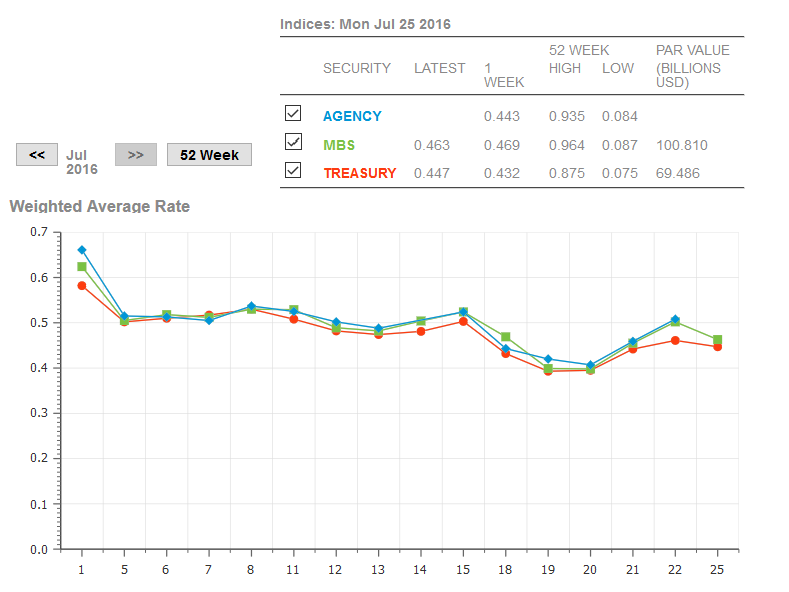 Increasing the dollar's yield premium over the rest of the G4 should give it a little boost. Beyond that, however, there's the question of flows. The LIBOR panel is made up of mostly foreign banks, many of which have made a practice of borrowing USD by selling commercial paper to money funds. If the demand is no longer there and/or the rates are pushed higher, at some point it may just be easier to buy USD in the FX market than to borrow it. We have seen this movie before where cross currency basis heats up; it seems likely to do so again. * Continued FRA/OIS widening? Consensus seems to be that although spot FRA/OIS has widened quite a bit, it could eventually resolve up to 45 bps or so. From Macro Man's perspective, that seems fairly punchy; at some point, it will become attractive to take the credit risk in prime funds if they are offering, say, double the yield of govvy funds. If we do end up seeing such a swing in a few months, that should push FRA/OIS back down, though not to levels prevailing before the regulation started to bite. * Weaker gold/commodities? Obviously in the bigger picture gold has performed strongly, thanks to the extremely low level of real interest rates around the world. However, if real short cash rates in the US rise and the dollar performs well, this could represent a further headwind for metals, particularly given the flows into the spaced over the last six months. * Whither credit spreads? If we observe a permanent widening in short term credit spreads, should that have an impact elsewhere? To be sure, it's possible for the credit curve to flatten, but in extremis if you could get a yield pickup in a high quality prime money fund similar to what you could get from investing in IG, wouldn't you do that? (This is not to say that these spreads will ever come close to the same level.) At some level, however, ructions at the front end of the credit curve should begin to impact the rest of the credit market. If Macro Man is right about a natural lid to how far FRA/OIS can go, then it may not be an issue, but still bears watching. Readers, particularly those with intimate knowledge of the issue, are invited to weigh in with their own views. ...wider usd cross currency basis- occam's razor? Interesting analysis, and important in a NIRP/ZIRP world. LB also wonders whether some small component of higher LIBOR reflects a tiny bit of concern about the health of the banks themselves. The major US banks are in good shape as far as the balance sheets are concerned, but there may be a few tiny concerns about regional banks with loans in the energy space? In other news, which will likely dominate today's price action.... regular readers will know that LB [and MM among others] have been promoting the idea of a stronger dollar for some time, and LB has been short CADUSD and USO as crude oil weakens once again. For the last few days we have also been long JPY after a little bit of knife catching. Today brings a strong surge (aka face-ripper) in the yen on a Buy The News reaction / to Japan's new stimulus program, which seems to consist to some extent of recycling already announced programs. Given the relationship between USDJPY and Spoos, today may be a relatively rough day for US equities. In Europe, the banks are falling again, with the stress test results due on Friday. DBK is off almost 4% this morning. Certain commenters here, including LB and Mr Beach, will likely be in a good mood. 12y-o HFM remains on Bae-cation, however. Thanks for a thoughtful analysis. Also, LB's comment re concerns over the health of banks seems reasonable - indeed, it could be characterised as being far too polite to said institutions. 1. Monthly: this month's spike failed to clear important resistance in the high 13s/low14s, precisely nailed the 382 of the entire bear run, bounced off a downtrend line connecting the 2011 and 2012 highs, and failed to hold above a declining 5OMA (for what that's worth). 2. Weekly: currently perched just above chart support, a declining 200MA (for what that's worth), and the 236 of the runup from last December's low. 3. Daily: sitting at chart support just above the 50 retrace of the post-Brexit runup and close to the trendline from the May low. All that + commercial positioning suggests a pause would refresh, and a runup in USD real rates at the short end could indeed be the catalyst. Thinking of going long Italian Bank shares, possibly before the stress test of Friday. While Italian growth will continue to be sluggish (exp for 2017 are below 1%) current Bank Stock valuation looks extreme, especially from a P/B ratio point of view (around 0.4-0.5 for the biggest ones). While some of those NPL will redeem at zero, looks hard for me to see an average recovery ratio below 40% for the whole loan portfolio. Any strong view against or in favor? I expect lower recoveries on Italian loans. Unsec has been around 10% historically, sec around 30%. Depending on the location of the borrower the workout takes between 3 and 7 (some say even 10) years which burdens recovery rates. Some banks claim higher rates because their loans are collateralized but what this collateral is worth in the first place and what it yields at an auction (assuming they are not the only ones trying to liquidate some farmhouse in Tuscany) are entirely different points. Very interesting comments MM & Co.
Obviously the price action in Libor/Eurodollar begets the question of funding stress within the global banking system, in a muted way though - but also how much higher and for how long before it becomes a problem? Please correct me if I am wrong, but the effect of the money market fund "solvency" might create a funding gap for CDs & CPs which might ultimately push US$ corporate spreads wider? I reckon that the Fed has its hand tied over any significant hike nor normalisation because of the very large wall of refinancing over the upcoming 3 years. Don't even get me started on this Nico...makes me sick to my stomach. @nico - good to see u back. Good article today - the funding spreads have generally been a red herring in terms of predicting stress because of the ongoing balance sheet re-engineering at banks - plus, I would argue (as MM has to some degree) that if they meant much, euribor and not libor would perhaps be the epicenter. Gotta love the setup where institutions are sitting fat and happy because their 'barbell' strategy of hedging their equity exposure by buying long bonds (at rates ranging from zero to zero) and precious metals at the same time has protected them so far. This has all the characteristics of a wiley coyote when people realize the reason those things are up is because they've been buying them in a thin market and for no other reason. Then, 5 seconds later they realize that equity protection is best not obtained by piling your portfolio full of correlation risk. Reminds me of the 'barbell' into oil and bonds in late 07 early 08. Smartness and cuteness are not necessarily your friends in this game - something I learnt the hard way. Surely higher rates is as good excuse as any not to go for higher rates. Nico - would you consider current mkts as being max mindf*ck? Tell me I'm not alone. 1-year dollar Libor is used as an index for adjustable residential mortgages in the US. Would you expect this rate rise to last? If so, anyone still in an adjustable will be unpleasantly surprised come adjustment day. It's easy to get bearish now, for a trade but remember spoo s just made new highs. Can't just disregard that, at least while we are above old highs. Abe will announce details of a quarter trillion dollar stimulus package on Wednesday afternoon, half of which is expected to be spent by national and local governments as well as cheap loan programmes offered to private-sector projects by semi-government financial institutions. Japan’s Nikkei share average has risen more than 2.5% on Wednesday afternoon, while the yen has fallen dramatically. Kuroda is up to bat on Friday!